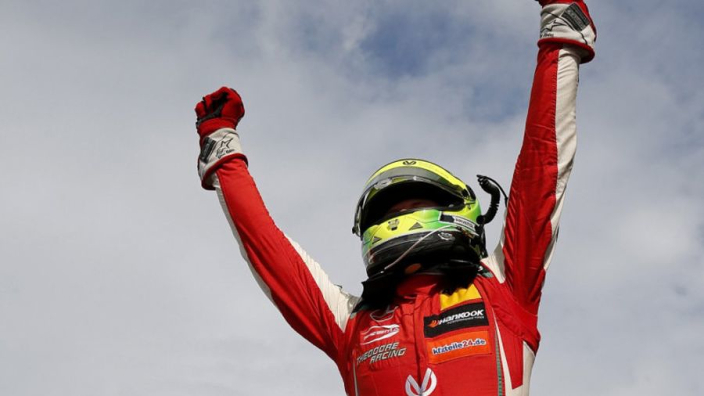 Ferrari team principal Mattia Binotto says Mick Schumacher has been signed into the Scuderia's Driver Academy on talent alone and not for emotional reasons as he begins to follow in the footsteps of his legendary seven-time world champion father, Michael Schumacher. Schumacher's place in the Maranello junior system was finally confirmed on Saturday, the move serving as a reward for winning European Formula 3 in 2018. The 19-year-old is likely to take part in two in-season tests for Ferrari next year. Binotto's time at Ferrari dates back to Schumacher Snr's record-breaking time in red at the turn of the century and signing the icon's son is the first move made by Ferrari since Binotto's ascension to team principal. "For someone like me who has known him from birth, there's no doubt that welcoming Mick into Ferrari has a special emotional meaning," Binotto said in a statement. Schumacher Jnr will step up to Formula 2 next year with Prema, the team with whom he won F3 in 2018, but the tantalising prospect of the famous name returning to the famous team is becoming increasingly likely. He said: "It is more than obvious that Ferrari has a big place in my heart since I was born and also in the hearts of our family, so I am delighted on a personal level about this opportunity as well.